Rust Bullet Automotive FAQs Application of Rust Bullet products to cars and vehicles. > Rust Bullet Automotive FAQs Application of Rust Bullet products to cars and vehicles. What is the difference between Rust Bullet standard formula (Gold Label) and Rust Bullet Automotive formula (Silver Label)? Do I Apply Rust Bullet only where Rust is Apparent? Can I Apply Rust Bullet Automotive with a Brush? How do I Apply Rust Bullet Automotive with an HVLP Spray System? Why Do I Need to Apply Multiple Coats of Rust Bullet? When Do I Apply the Next Coat of Rust Bullet? Can Rust Bullet be used as a Primer? Is Rust Bullet Compatible with Automotive Fillers, Fiberglass, and Primers? What should I do if I waited too long before applying the next coat of Rust Bullet? What Steps are Required when Applying a Top Coat over Rust Bullet? Is Rust Bullet advised for use on Gasoline Tanks? Is Rust Bullet advised for use on an Exhaust System? Can I apply Rust Bullet under a Truck Bed Liner? Does diesel fuel degrade Rust Bullet? Will Rust Bullet have an effect on Rubber CV Boots , Rubber Seals etc? Can steel and alloy suffer from galvanic reaction where the two are joined? Both Rust Bullet and Rust Bullet Automotive are industrial strength protective coatings. They have the same patented anti-corrosive properties and will out perform any other rust inhibitive, protective coating on the market. Rust Bullet Automotive is formulated a bit thinner than the Rust Bullet standard formula to easily flow through an HVLP auto finishing spray system. Rust Bullet Automotive has more metal and will produce a smoother finish typically desired for automotive projects. The automobile industry uses steel in its manufacturing wherever structural strength is needed. Ideally this steel should be protected before it starts to rust and corrode; thus preserving the strength and integrity it was originally designed to provide. Rust Bullet not only kills existing rust, it seals and protects surfaces that have not yet started to rust providing years of prevention. If it is made of iron, metal, or steel, it will rust and corrode if left unprotected; start protecting your investment today. All Rust Bullet Formulas may be applied by brush, roller, or spray equipment. A brush coat should be applied evenly without buildup in a cross hatch method (up and down and side to side). Even coats using the crosshatch application method will produce the best results. Always keep a wet edge on the tip of your paint brush. A two to three coat brush application generally achieves a dft (dry film thickness) of 6 mils. Roller applications result in an approximate dft of 3 mils per coat. An HVLP spray system applies approximately 2 mils, while the Airless sprayer application averages 3 to 4 mils per coat. One gallon of Rust Bullet or Rust Bullet Automotive covers approximately 200 sq.ft. with a finished dft of 6 mils. Rust Bullet Automotive applied through an HVLP spray system using a 1.5 tip with 40 PSI will achieve a dft of approximately 2 mils per coat. It is important to run Xylene through the spray equipment prior to spraying the first coat of Rust Bullet Automotive to remove any moisture that may be trapped in the equipment. After the application of each coat of Rust Bullet Automotive, flush the gun or submerge the tip in Xylene. It is important to keep the equipment and sprayer clean. If the spray gun has a filter, it must also be cleaned. Acetone may be used if Xylene is not available. Application equipment must be cleaned immediately after use to avoid damage. Rust Bullet is a ONE STEP, TWO COAT product. As Rust Bullet cures it expels solvents and releases a carbon dioxide gas while dehydrating the rust. The first coat of Rust Bullet soaks through the rust down to the metal below, encapsulates the rust, and dehydrates it. The first coat must be applied generously enough over the rust for this process to take place. As the first coat dries and gases off, tiny pin holes may form in the coating. The second coat is critical to fill any pin holes and seal the surface with an air tight, armor like shield of protection. If the pin holes are not sealed after the first coat, air and moisture may penetrate the coating exposing the surface to further damage. Apply additional coats to achieve the desired dft for the appropriate protection for the project. Optimum drying time between coats of Rust Bullet is 2 to 4 hours. When the product does not transfer to a gloved finger tip it is ready to accept an additional coat of Rust Bullet. It is important that corners, edges, and heavily pitted areas are adequately covered. When Rust Bullet cures it pulls tight to the center; therefore, it is particularly important that edges and corners are sufficiently covered. Rust Bullet can be used as an automotive primer and can be wet sanded and directly painted over. Before applying a finish color to a surface coated with Rust Bullet, we recommend wet sanding the surface with a very fine sand paper. This wet sanding may be achieved by using 100 to 150 grit sanding paper. Apply an additional coat of Rust Bullet, again wet sanding to a very smooth surface, wait 6 - 7 hours before applying a topcoat (time may vary depending on weather conditions). 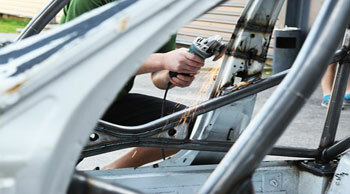 Body fillers, premium automotive primers, and automotive paint may be applied over Rust Bullet. To insure proper adhesion, Rust Bullet should be sanded with a 100-150 grit sand paper before applying body fillers, fiberglass or premium primers. When working on body parts, Rust Bullet should be layered, i.e. apply two or three coats of Rust Bullet, apply the bondo or fiberglass, and then apply another coat of Rust Bullet. This will seal out any moisture the body filler might attract while adding strength and durability to any weak places. You can apply Rust Bullet over existing bondo, fiberglass, or paint if there is no rust present after scuffing the surface with 100 or 150 grit sand paper or sanding block. If bondo is applied directly to a rusted area it has a tendency to absorb moisture which will cause further rusting and bubbling in the bondo. Rust Bullet works best when it is in direct contact with the metal. The final coat of Rust Bullet should be wet sanded before the application of a top coat. Optimum drying time between coats of Rust Bullet is approximately two (2) to four (4) hours depending on humidity levels. If more than 72 hours have passed since the previous coat of Rust Bullet, the surface pores will have closed making it necessary to scuff up the surface with a 100 to 150 grit sanding block. Scuffing the surface will reopen the pores allowing Rust Bullet to successfully accept an additional coat of Rust Bullet or a top coat. Rust Bullet’s pores remain open and receptive to a top coat for approximately 24 to 72 hours after the application of the final coat of Rust Bullet. Once the pores have completed the gassing off while dehydrating the rusted areas, the pores will begin to close; this process generally takes 4 – 5 days. High humidity conditions may accelerate this process to 2 - 3 days. Ideally a topcoat should be applied within 24 to 48 hours after the final coat of Rust Bullet. It is necessary to allow enough time for the curing or gassing off process to complete. The application of a top coat before this process is complete may result in dimpling of the surface and an undesirable finish. If you are using a premium finishing paint and the manufacturer has specific primer requirements, it is recommended you apply the primer over Rust Bullet after the surface has been scuffed up and wet sanded. Rust Bullet is an excellent adhesion promoter and enhances the adhesive properties of any topcoat you choose. A top coat is not necessary with Rust Bullet Automotive formula; however, a topcoat may be applied 24 hours after the final coat of Rust Bullet. If black is the finished color desired, Rust Bullet BlackShell™ is an excellent choice for a Gloss Black finish. BlackShell is specifically designed as the optimum topcoat for Rust Bullet or Rust Bullet Automotive. BlackShell is an outstanding protective stand alone coating that requires no base coat or topcoat and when applied over Rust Bullet provides unbeatable protection with a gloss black finish. Rust Bullet, or the exceptional combination of Rust Bullet top coated with BlackShell, are unsurpassed in rust, corrosion, and abrasion protection. Rust Bullet is not affected by gas itself. Rust Bullet was not and is not designed as a tank sealer on the inside of a tank. We have not tested for this application and can offer no promise as to what the outcome will be if used as such. Rust Bullet can be used on the exterior, but it was not designed for internal use on a gas tank. Rust Bullet can withstand a constant temperature of 315 degrees Fahrenheit with burst of up to 700 degrees Fahrenheit for short periods of time (approximately 24 hours). Rust Bullet provides excellent protection for most engine components; however, is not recommended for coating exhaust systems due to the excessive heat produced on headers, exhaust manifolds, catalytic converter or exhaust pipes. Rust Bullet provides excellent surface protection under bed liner material. Apply Rust Bullet according to the application guidelines. As with the addition of any topcoat or other product, if 72 hours have lapsed after the final coat of Rust Bullet, the surface should be scuffed with 100-150 grit sanding paper or sanding block to ensure proper adhesion of the liner material. Rust Bullet will hold up to #2 Diesel Fuel without issue. As Rust Bullet Products form an armor tuff non-porous finish, the coating will have the same influence on rubber surfaces as on all other surfaces. Rust Bullet is a moisture cured product that will dehydrate the rubber (absorb the moisture) thereby reducing flexibility. To prevent Rust Bullet Products from adhering to the rubber surface, apply an oil based lubricant (i.e. rubber lube) to the rubber using a towel or cloth. Do not use a spray lubricant. Apply with caution to prevent the lubricant from coming into contact with the surface to be coated with a Rust Bullet Product as the lubricant will interfere with the adhesion process. This will enable you to wipe off any overspray easily. Rust bullet will prevent the chemical action between the two metals and has phenomenal adhesion which will bond easily to both the aluminium and steel.